After surviving an automobile accident unscathed in 2010, Icelandic Member of Parliament Árni Johnsen attributed his good fortune to a family of "hidden people" who lived in a boulder near his car wreck. The boulder will be moved on the ferry Herjólfur and the elves will travel in a basket lined with sheep skin so that they can be comfortable on the journey. Ragnhildur explained to Árni that when he was in the accident everything went crazy on Hellisheiði. 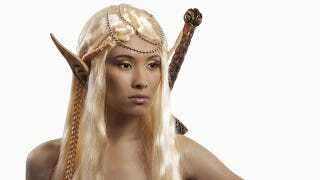 Elves from all neighboring settlements were called out and there was much confusion until one large being took control of the situation. Thank goodness for that "one large being." Johnsen should count his blessings that these were friendly elves and not imps. Via Fortean Times. Image: Fotogroove/Shutterstock.